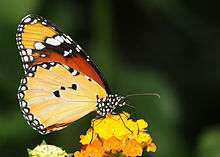 Danaus chrysippus, also known as the plain tiger or African monarch, is a medium-sized, butterfly widespread in Asia and Africa. It belongs to the Danainae ("Milkweed butterflies") subfamily of the brush-footed butterfly family, Nymphalidae. Its coloration is mimicked by multiple species. The plain tiger is believed to be one of the first butterflies to be used in art. A 3500-year-old Egyptian fresco in Luxor features the oldest illustration of this species. The plain tiger can be considered the archetypical danaine of India. Accordingly, this species has been studied in greater detail than other members of its subfamily occurring in India. 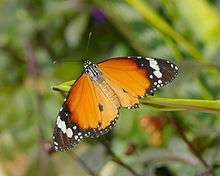 The Danaus chrysippus is a medium-sized butterfly with a wingspan of about 7–8 centimetres (2.8–3.1 in). The body is black with many white spots. The wings are tawny, the upperside brighter and richer than the underside. The apical half of the forewing is black with a white band. The hindwing has three black spots around the center. The hindwing has a thin border of black enclosing a series of semicircular white spots. Background color and extent of white on the forewings varies somewhat across the wide range; see Systematics and taxonomy below. The male has a pouch on the hindwing. This spot is white with a thick black border and bulges slightly. It is a cluster of specialised scent scales used to attract females. The males possess two brush-like organs which can be pushed out of the tip of the abdomen. The range of the plain tiger extends from Africa and southern Europe, eastwards via Sri Lanka, India, and Myanmar to China, Java and Sulawesi. It is a very common species. From the Cape Verde Islands through tropical Africa to Yemen and Oman. Browner with broader white forewing spots. Saint Helena, southern tropical Africa to South Africa, Madagascar, Comoros, Seychelles and Mascarenes. Small white forewing spots. D. c. alcippus is well on the way of becoming a distinct species. On the other hand, the former subspecies petilia is nowadays recognized as a good species, the Lesser Wanderer. More enigmatic is the status of the former subspecies (or forms) dorippus and bataviana. These are tentatively also regarded as a distinct species, the "dorippus tiger" (Danaus dorippus). However, it appears (from analysis of mtDNA sequences, which are only inherited from the mother) that the dorippus tiger is the product of an ancient lineage of Danaus hybridizing with plain tiger females. As the plain tiger is known to be parasitized at least occasionally by Spiroplasma bacteria which selectively kill off male hosts, a subsequent scarcity of plain tiger males might have led to this hybridization and the evolution of the dorippus tiger. From the color pattern of this species, it can be assumed that the ancient lineage had no black apex on the forewings, as this character is still absent in D. dorippus. The presumed subspecies cratippus most likely belongs to either the lesser wanderer or the dorippus tiger, but confirmation of its taxonomic status requires more research. In any case, these three species are closely related; their closest relatives, in turn, might be the soldier (D. eresimus) and queen (D. gilippus) butterflies. The upper hindwing is more or less very white; about half of the individuals have a second submarginal spot in the forewing. Occasionally found in Southeast Asia, very rarely in India. The upper hindwing has white markings. Occasionally found on Sulawesi. The upper hindwing has a subapical band composed of somewhat larger spots, and an additional forewing spot as in f. alcippoides is always present. Found throughout the eastern parts of this subspecies' range. It is found in many habitats including desert (pending availability of food) and right up into the mountains at altitudes up to 9,000 feet (2,700 m). 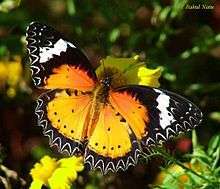 It is primarily a butterfly of open country and gardens and unlike the related common tiger, is least common in damp, forested, hilly regions. It is a somewhat migratory species. 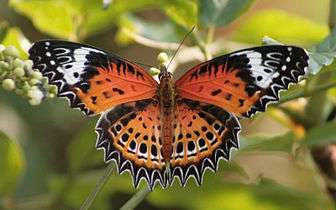 This butterfly is perhaps the most common of Indian butterflies and is a familiar sight on the subcontinent. It flies from dawn to dusk, frequenting gardens, sipping from flowers and, late in the day, fluttering low over bushes to find a resting place for the night. As usual for diurnal butterflies, this species rests with its wings closed. When basking it sits close to the ground and spreads its wings with its back to the sun so that the wings are fully exposed to the sun's rays. The plain tiger is protected from attacks due to the unpalatable alkaloids ingested during the larval stages. The butterfly therefore flies slowly and leisurely, generally close to the ground and in a straight line. This gives a would-be predator ample time to recognise and avoid attacking it. 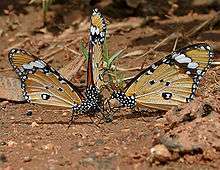 Inexperienced predators will try attacking it, but will learn soon enough to avoid this butterfly as the alkaloids in its body cause vomiting. The butterfly also has a tough, leathery skin to survive such occasional attacks. When attacked it fakes death and oozes nauseating liquid which makes it smell and taste terrible. This encourages the predator to release the butterfly quickly. The plain tiger thus has the ability to recover "miraculously" from predator attacks that would kill most other butterflies. The protection mechanisms of the plain tiger, as of the other danaines, and indeed of all colorful unpalatable butterflies, result in predators learning this memorable aspect at first hand. 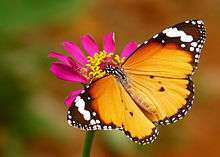 Predators soon associate the patterns and habits of such butterfly species with unpalatability to avoid hunting them in future. This advantage of protection has led to a number of edible butterfly species, referred to as "mimics", evolving to resemble inedible butterflies, which are referred to as the "model". The resemblance is not only in color, shapes, and markings, but also in behavioural and flight patterns. This form of mimicry—where an edible species mimics an inedible species—is known as Batesian mimicry. The similarity between the plain and common tigers makes them Müllerian mimics, as the adverse experience a predator makes with either species will also protect the other. The plain tiger breeds throughout the year in India, except in the Himalayas where it is seasonal. This presumably applies to the other tropical and subtropical parts of its range too. 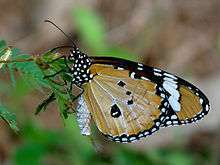 The female plain tiger perches on the upperside of a leaf and, curling its abdomen around the edge, lays an egg on the underside. Only one egg is laid per leaf to avoid overcrowding of the caterpillars. The egg is silvery white, shiny, tall, bullet-shaped with an apical point and ribbed sides. After the caterpillar hatches, its first meal is the eggshell itself. It lives its entire larval life on the lower side of the leaves. During the first few days it has a very interesting manner of feeding: It will take up a spot on the underside of the leaf and nip a complete circle around itself in the lower cuticle of the leaf. By doing this it stops the poisonous sap of its host plant from flowing into the area inside the circle. It then proceeds to eats the lower surface of this area, leaving the upper cuticle intact. As it grows, it eats both the lower and upper cuticle of the circle thus leaving smallish circular holes in the leaves of its host plant. When its mandibles are large enough it eats the complete leaf by gnawing at the edges. The caterpillar is uniformly cylindrical. Its body is covered with bands of black and white interspersed with thick, yellow, dorsolateral spots. The most striking characteristics are the three pairs of long and black tentacle-like appendages. The first pair is moveable and also the longest. The tentacles are present on the third, sixth and twelfth segments. The head is shiny, smooth and has alternating black and white semicircular bands. The legs and prolegs are black and the prolegs have white bands at their bases. The pupa hangs freely from the support. It is widest at the seventh abdominal segment where it has a double chain of extremely tiny golden and black beads. There are tiny golden spots on the shoulders and wing-cases. The rest of the pupa is pale green with a smooth surface. The pupa is light pink when formed among dry or unnatural objects. Host plants from other families include Dyerophytum indicum (Plumbaginaceae), Ficus (Moraceae; recorded on F. laevis, F. racemosa), Ipomoea (Convolvulaceae; recorded on I. alba, I. bona-nox), Lepisanthes rubiginosa (Sapindaceae) as well as some Euphorbiaceae, Malvaceae, Poaceae, Rosaceae and Scrophulariaceae. Wikimedia Commons has media related to Danaus chrysippus. Agius, J. (2014): Danaus chrysippus form alcippoides (Linnaeus, 1758) a new form for the Maltese Islands. SHILAP Revista de lepidopterología 42(167): 429-432. Gil-T., Felipe (2006): A new hostplant for Danaus plexippus L. in Europe. A study of cryptic preimaginal polymorphism within Danaus chrysippus L. in southern Spain (Andalusia) (Lepidoptera, Nymphalidae, Danainae). ISSN 0171-0079 | Atalanta 37 (1/2): 143-149, 279. Full article: pdf. HOSTS (2007): A Database of the World's Lepidopteran Hostplants. Retrieved 2007-AUG-01. Larsen, Torben (1994): Butterflies of Egypt. Saudi Aramco World, issue 5 (September/October): 24-27.
van der Heyden, T. (2010): Orbea variegata (L.) Haworth, 1812 (Apocynaceae, Asclepiadoideae) als Futterpflanze der Larven von Danaus chrysippus (Linnaeus, 1758) auf den Kanarischen Inseln (Spanien) (Lepidoptera: Nymphalidae, Danainae). SHILAP Revista de lepidopterología 38(149): 107-110.